Question: How does the Wait List work? Answer: The Wait List feature in LionPATH is replacing the Watch List function in eLion. 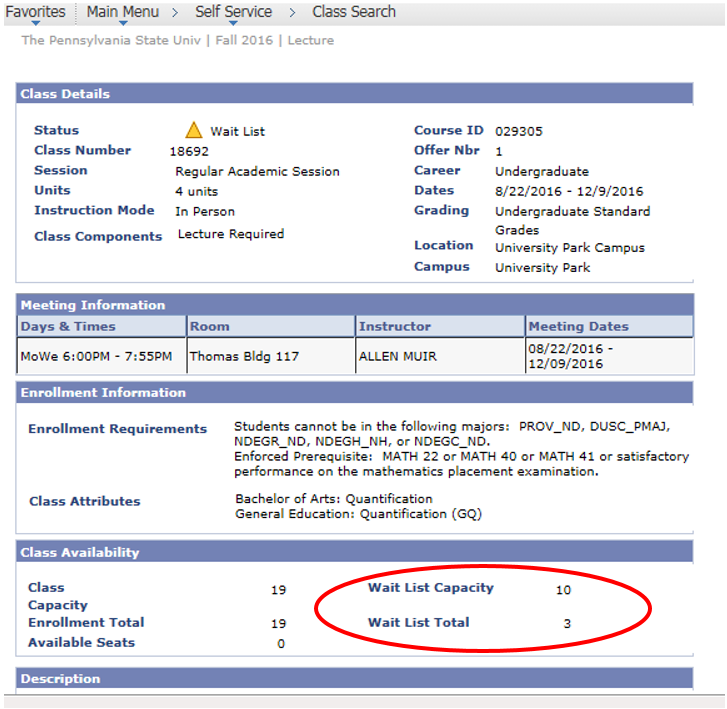 You can choose to enroll in the Wait List when a class is full. The Wait List is like a line. When a seat becomes open, the student at the top of the list is automatically enrolled in the class, and everyone moves up a spot. Students should monitor the courses they add to their Wait List and remove courses they do not wish to keep on their Wait List. The Wait List will be available and run through the last day of the regular drop period. For more information on how to use the LionPATH Wait List, please read the Wait List FAQs. Question: I cannot get on Wait List for a class. What should I do? Answer: It is important to note that not all courses have a Wait List. First, verify the class you want has a Wait List. You can see this information when searching for a class in the Class Search. Question: How do I find out how many spots are left on the Wait List? 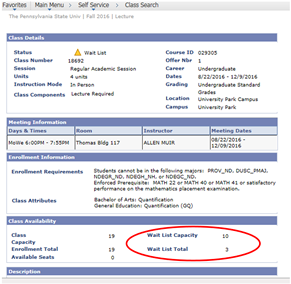 Answer: You can view the Wait List capacity and total number of students on the Wait List by viewing the class details. Click on the class number or section to view the class details. Question: How do I know if the course Wait List is full or has no Wait List? Answer: Click on the class number or section to view the class availability section within the class details. Question: How often is the Wait List updated? Answer: Wait Lists are updated periodically throughout the day. So, there may be a period when there is an opening in a class and a Wait List. During that period, a student who attempts to register for that class will be able to join the Wait List. The open spot will be assigned to the first person on the Wait List when the process runs.